In 2014, the Port of Antwerp handled almost 200 million tonnes of maritime freight, making it the second busiest port in Europe; it offers regular liner, shortsea and feeder services to some 1,400 ports worldwide, and it has 610 hectares of covered storage, giving it more storage space than all the other northwestern European ports combined. The Port of Antwerp fits well into the global supply chain jigsaw; it is simultaneously a leading gateway to Europe and a gateway to the world. “With over 220 regular maritime breakbulk services, we can reach the whole world from Antwerp”, says William Moyersoen, CEO of ArcelorMittal Logistics. However, the port is much more than just a facilities provider, services provider and landlord, more than just a particularly well-located and connected, efficient and reliable port, and more even than just the largest integrated maritime, industrial and logistics hub in Europe. As it focuses on meeting the constantly evolving needs of its current and potential clients, the Port of Antwerp is a supply chain partner and proactive facilitator. This partnership approach is central to the success of both the port and its clients. “Our cooperation with the Port of Antwerp improves the performance of our supply chain”, says Christiaan Boone, Overseas Supply Chain Distribution Manager at petrochemical giant Borealis. Over many years, Antwerp Port Authority, logistics operators and the whole port community have worked together to maximise innovation, efficiency and environmental sustainability. For example, through port-wide initiatives such as the Barge Traffic System, Premium Barge Service and Antwerp Port Community System (APCS). APCS, the Port of Antwerp’s shared electronic communications and solutions system, enables the rapid exchange of data between businesses (B2B) and between businesses and government (B2G). To continually improve efficiency, there is a strong focus on achieving economies of scale, synergies and cost savings. Initiatives around the port have included process standardisation, transport and warehousing consolidation, outsourcing of peripheral operations, and enhanced business continuity and risk management. Similarly, Antwerp Port Authority and its partners cooperate to ensure the speed and flexibility required to meet any unexpected fluctuations in demand and supply. There is now improved collaborative planning, information sharing and inventory management, plus a growing number of joint developments. 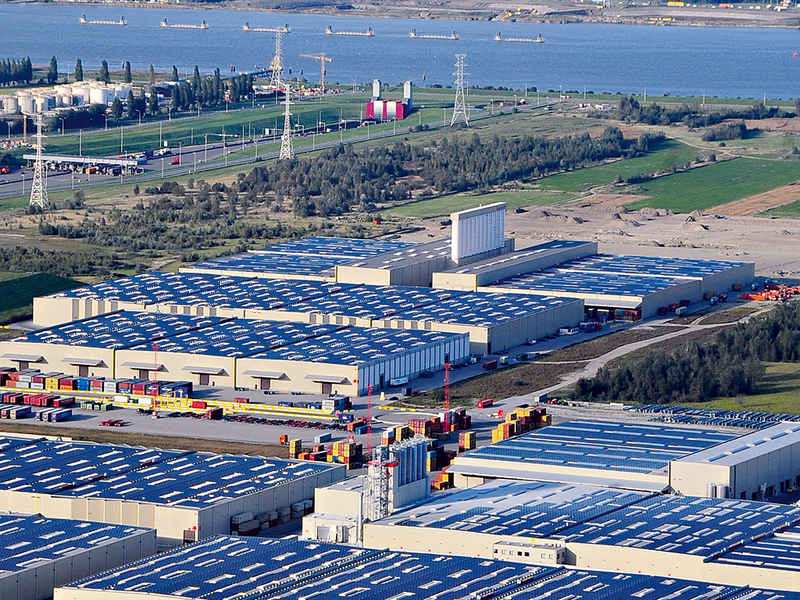 In addition to offering a wide range of warehouses and other facilities and sites, Antwerp Port Authority plays a leading role in initiating, investing in and attracting investor interest in new developments. Fully aware of the rapid and increasingly globally oriented changes in logistics and industry, it takes its facilitator role seriously. The Saeftinghe Development Area on the River Scheldt’s Left Bank will make around 1,000 hectares available for economic development. A new tidal dock north of the Deurganckdock is also planned. The port is also developing two major areas for specific logistics operations with multimodal access, as the Flanders regional zoning plan provides for the development of the logistics parks Schijns (Right Bank) and Waasland (Left Bank).